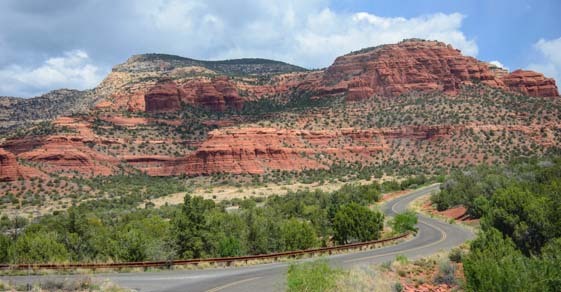 Oh, Sedona - Scenic drives in the red rocks!! Oh my. 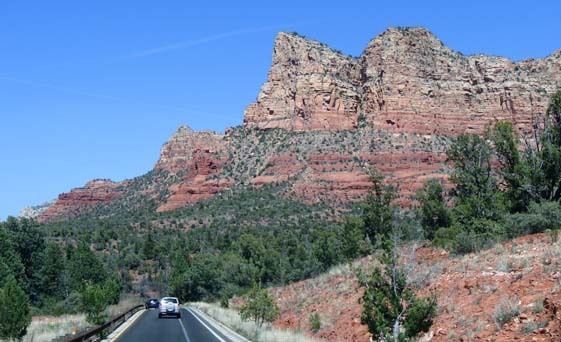 Sedona is breathtaking!! Every drive around town is spectacular. This is an outdoor lover’s paradise. 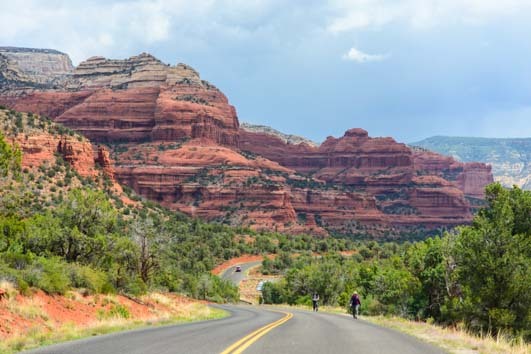 Whether your passion is hiking, biking, horseback riding, photography, or just sitting and staring at Nature’s beauty and contemplating the meaning of life, Sedona has something for you. 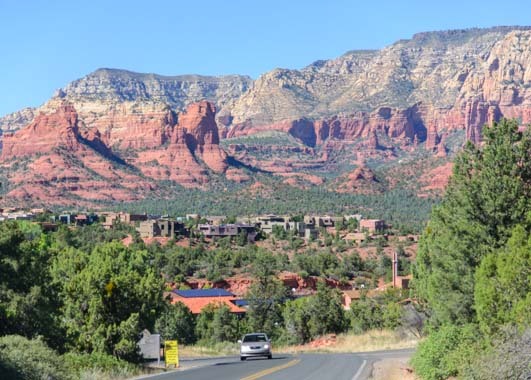 We have been to Sedona many times in the past, but always as hurried weekenders, trying to make the most out of our 48 hours away from the workaday world. This time we wanted to stay a while and explore all the byways and backways. And scenic drives there are aplenty! 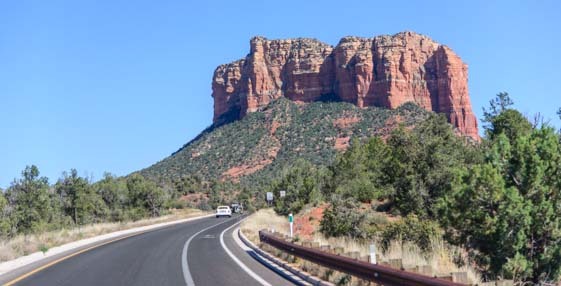 Every time we jumped in the truck, we got an eyeful of majestic, craggy, red rock landscapes, whether we were headed out on an epic hike or just going to the store for a gallon of milk. For drivers, it’s hard to keep your eyes on the road. 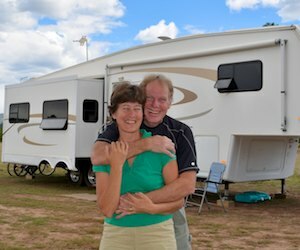 The locals love these views too! We stopped at a little place for a sandwich, and the waitress was practically bouncing off the tables as she danced around taking orders. “Look at the view from my office!” She sang as she flew by, her arms piled high with plates and her pony tail swinging. She couldn’t have beamed a happier smile. 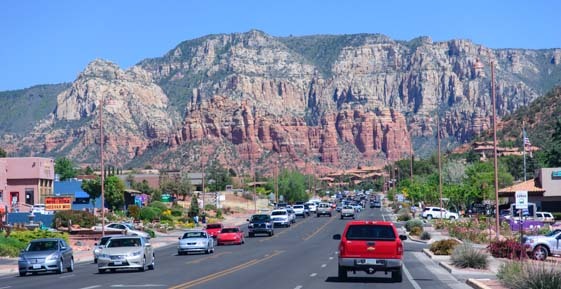 Sedona is a popular place. And she was right. The view out the window, out the door, and even out in the parking lot was to die for. I quickly figured out that it was folly to go anywhere without my camera around my neck. Driving around town, it’s impossible for newcomers to keep their eyes on the road. But the poor drivers have to!! Luckily, I got to be the passenger whenever we went anywhere in the truck. Traffic can be heavy heading into town. My camera stayed very busy as I tried to capture one incredible view after another right through the windshield. Well, if my pics didn’t quite do the scenes justice, at least it kept me entertained! 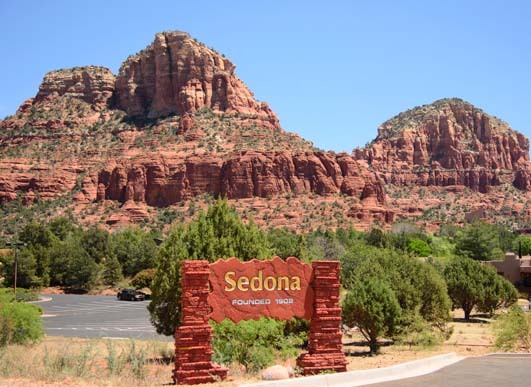 Not surprisingly, Sedona is an extremely popular place. Notice that almost every shot I took from our drives around town is not of an open road but of a road filled with cars as well as views. With these views, being in a traffic jam isn’t so bad!! We were there at the peak of high season. The roads were a zoo scene, the hotels were busy, the restaurants were overflowing, and the most popular trails were packed from dawn to dusk. 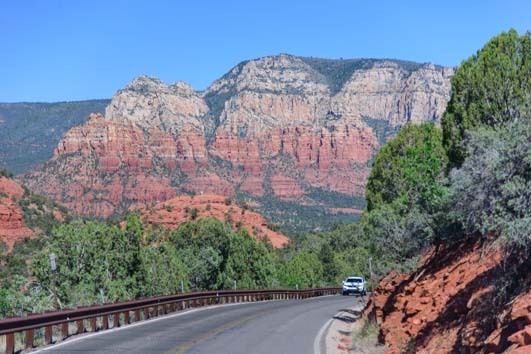 Of course, who cares if you have to sit in traffic when the views are that stunning?! We both spent many working years in bumper-to-bumper traffic where there was no view at all. What we would have given to have had these views instead! 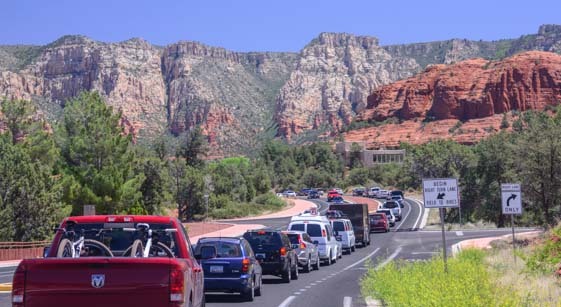 And sometimes, when luck was with me, the Sedona traffic jams stopped our truck right at the most perfect photo op moment. How ideal for this shutter-happy passenger! I was lucky to be in the passenger seat, camera around my neck! But sitting in traffic can be time-consuming. One Saturday it took us over an hour to go just a few miles. We needed to get to the post office before it closed at one o’clock. We set out on this errand with two hours to spare, but soon realized that even with just two miles left to go, there was no way we would get there in the 30 minutes that remained before it closed. So I got my bike off the bike rack and rode there instead while Mark pulled off and waited on a side street!! There are a lot of grand homes around town too! “Is this normal?” I asked the post office clerk when I got there. No! It turned out that there was a huge chili cook-off in town and a massive Cinco de Mayo celebration going on at Tlaquepaque, one of the in-town resorts. But that was an exception. Most of the time as we drove around town, we were so blown away by the red rock drama towering all around us that we barely noticed the other cars on the road. 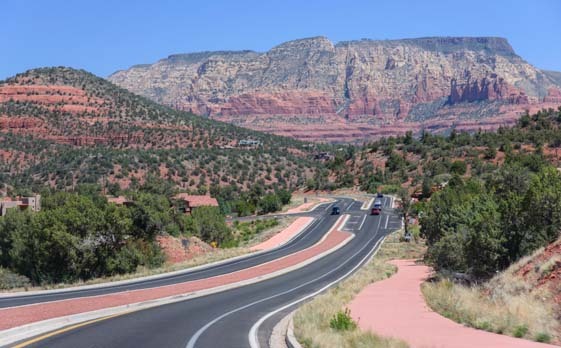 Every road around Sedona is stunning! On many occasions I found myself taking a photo in a parking lot. Now, you know you are in a spectacular place when you find yourself taking photos of parking lots!! One parking lot in particular, the home of the very cool bike & coffee shop, “Bike and Bean,” soon became a regular haunt for us. Mark liked going there because he got to hang around and talk bikes with the guys. He picked up all kinds of great tips about mountain biking, local trails, and gear for our bikes. I liked it because the coffee they serve is among the best I’ve had! 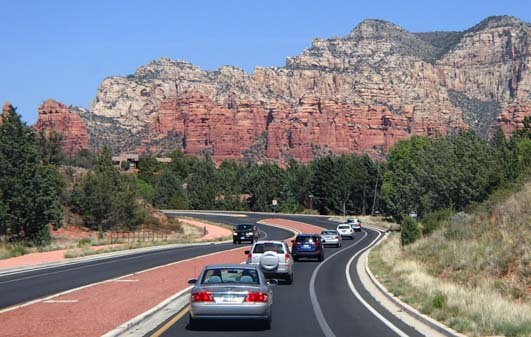 And so we began to get into the vibe of Sedona’s intriguing culture. 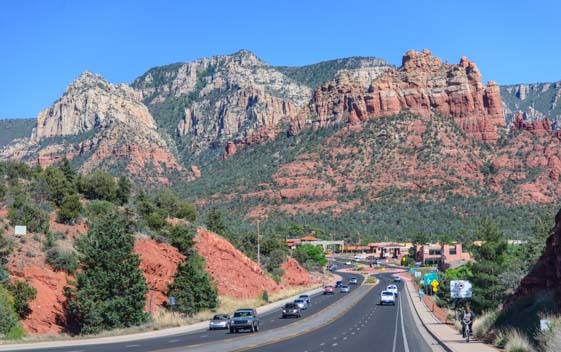 Mixing chic resorts with outdoor fun and a taste for rich coffee and flavorful microbrews, Sedona is a little upscale and a little quirky, and it sits in the middle of some of the most beautiful scenery our country has to offer! The “Bike and Bean” quickly became our home away from home!